The George Spangler Farm & Field Hospital Site is the best surviving example of a farm used as a corps field hospital during and after the Battle of Gettysburg. One minute, George Spangler and his family were working on their 80-acre farm. The next, the battle came to Gettysburg, and their family farm was transformed into one of the largest field hospitals and artillery staging areas in the battle. The farm with living history encampments and special programs is open to visitors Friday-Sunday in the summer months. Access is via shuttle bus from the Gettysburg National Military Park Museum & Visitor Center. Visitors with Civil War Surgeon living historian learn about surgery in 1863. Early in 1863, the George Spangler Farm was a thriving farm with livestock and crops, as well as an orchard and garden. 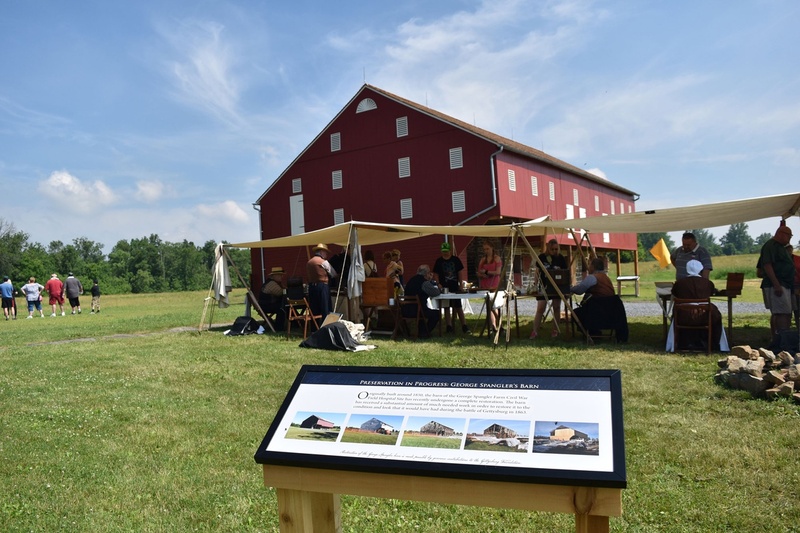 During the Battle of Gettysburg, the farm was totally transformed into a place of chaos and crisis for thousands of individuals: soldiers, surgeons, nurses, caregivers, volunteers and the Spangler family. The Spanglers chose to stay—all six of them living in just one room of their house for the duration of the field hospital operation. On July 1, 1863, the entire property was converted into a field hospital for the 2nd Division of the 11th Union Army Corps—which later became the main hospital for all wounded corps. Reportedly, 1,800 Union soldiers and 100 Confederate soldiers were treated at the Spangler property by at least seven Federal surgeons. Confederate General Lewis A. Armistead reportedly died in the summer kitchen located on the farm. Following the Civil War, the George Spanglers farm and home were in shambles. The medical team and troops used the fence rails for fuel, the crops and hay to feed soldiers and animals, and lumber and shingles for hospital furniture, makeshift beds and coffins. 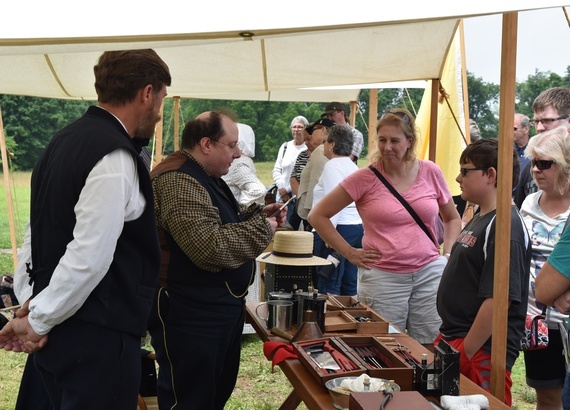 Visitors view and hear about Civil War surgical instruments with living historians. Explore the expertly restored barn that sheltered wounded soldiers from both sides; the rehabilitated summer kitchen where General Lewis A. Armistead reportedly died from wounds he received during Pickett's Charge; and the restored smokehouse. Living historians from all over the United States camp at the farm and provide visitors a glimpse of what surgeons, nurses, soldiers and even morticians did there. The George Spangler Farm & Field Hospital is a must-see for families and groups alike. Living historian at the George Spangler Farm & Field Hospital. The George Spangler Farm & Field Hospital is currently closed for the season and will reopen in the summer of 2019. 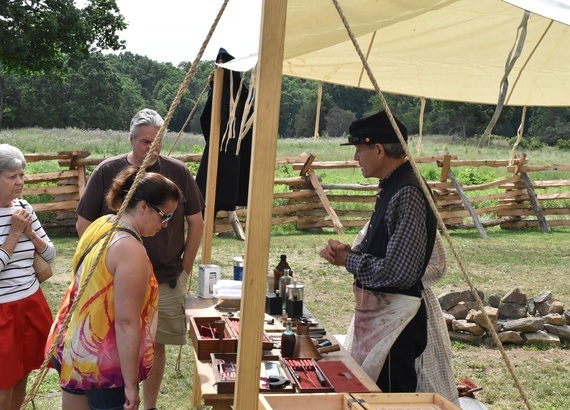 The schedule of living history encampments and special programs for the 2019 summer season will be announced by the spring of 2019. Accessible by shuttle bus only. Tickets are available at the Ticketing Counter inside the Gettysburg National Military Park Museum & Visitor Center, on our website and by calling Reservations at 877-874-2478 during the summer season. The shuttle bus travels to and from the Museum & Visitor Center three times each hour, beginning at 10 a.m. with the final shuttle returning to the Visitor Center at 3:20 p.m.
Due to limited space, strollers, wheelchairs and walkers may not be transported on the shuttle. Strollers are available on-site. If you have limited mobility without the use of a wheelchair or walker, please visit the Ticketing Counter for more information about access. The terrain at the site includes gravel walkways, uneven grassy areas and unpaved grounds.